Alas, I came down with a cold about a week and a half ago. Luckily, I made it through the work week with only minor discomfort and exhaustion before the cold knocked me out over the weekend. I hydrated and rested, so I felt perfectly fine again by the time the next work week started. And then only a few days after that, I came down with what seemed like the same cold (a sore, sore throat and a mild cough), with the addition of some body aches. It’s not quite the ideal way to spend the end of my summer, but there’s not much I can do except ride it out. I have been drinking an average of five cups of hot chamomile tea and honey per day (plus lots of water) and getting plenty of rest, but the recovery is still going slow. Rather than sit at home and sulk over this stupid cold for another day, I ran a few errands today. Partially because I was so bored of sitting around and doing nothing, and partially because there were things I actually needed to get done. I squeezed in a trip to the grocery store because I haven’t done much cooking this summer. And what else was I going to do with my sick time? There were already a few ingredients at home that I wanted to use, but I grabbed a couple more to round out this beautiful smoothie bowl. Peel and freeze bananas ahead of time, at least two hours to overnight. Clean, peel, and cut mangos, oranges (without the seeds), and strawberries. Add mangos, oranges, strawberries to blender with frozen bananas and a handful of coconut flakes. Blend until smooth. 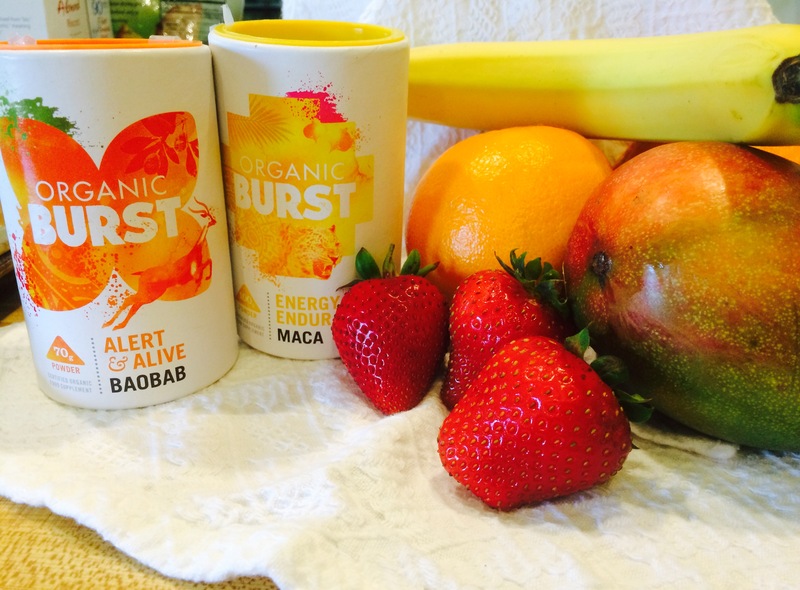 Add Organic Burst® superfoods and blend again until well-mixed. Serve in a bowl with additional sliced strawberries and coconut flakes. I don’t usually post actual “recipes” for smoothie bowls because I never use any when I make them myself. It really depends on what’s in the fridge or the kitchen when I’m craving some fruity goodness. However, this is full of vitamin C and superfoods (with calcium, potassium, iron, protein, and even more vitamin C), which are full of antioxidants and help protect the immune system. 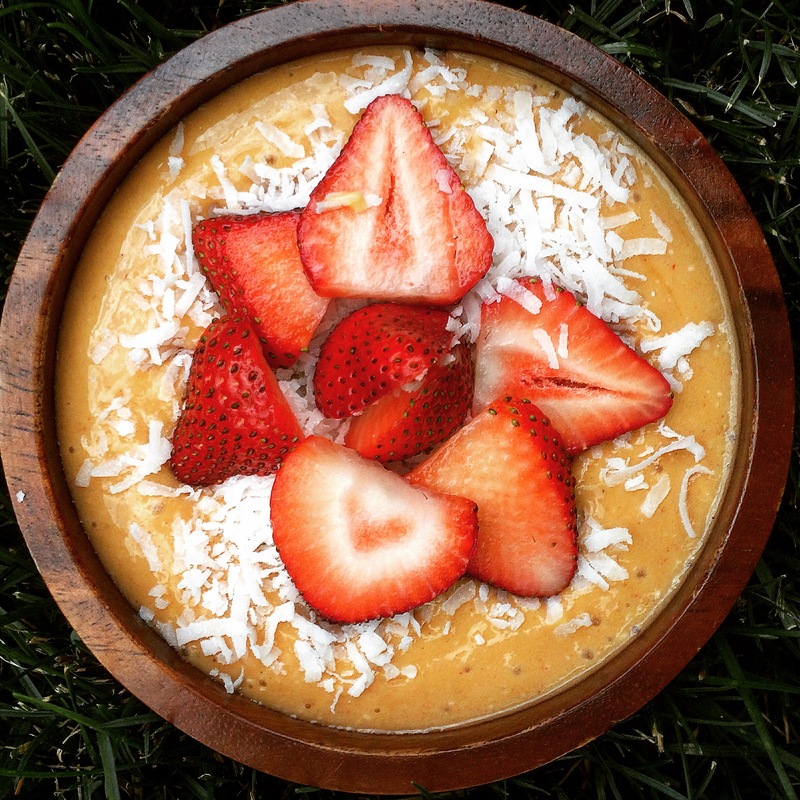 This smoothie bowl is perfect for a sick day, any time of the year!